Reversible wholecloth cotton quilt with elaborate hand quilting. One side is cream patterned material and the other plain pale yellow. It is padded but the type of padding is unknown. This is 1 of 2 quilts brought to Australia from England by Julie Atkinson's grand parents when they went back for a trip in 1956. " I don't think they were new at that time. They were possibly made by a group of ladies who met of an evening to do the quilting. I met the last of my great aunts in South Shields in 1967, Meg Thwaites. She would have been in her 80s then." Rectangular cot quilt of green floral cretonne with pleated frill. Machine made. The backing is the same material. It is tied not quilted. The padding is old woollen jumpers. Wholecloth quilt made from rayon/damask style fabric golden brown in colour with a raised stylised floral motif. Quilted to the self pattern of the fabric. 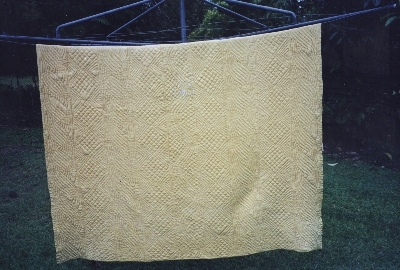 Hand quilted, backing is of gold coloured fabric. Cotton wadding showing through worn areas. 4 Pieces of a patchwork quilt which was formerly a whole quilt. It is pieced in cottons in blues reds and browns in many prints. There are whole circles and pieced circles against a plain cream calico background. It is wool lined and is quilted. There are the initials 'A.B.' and '1828' on a central piece. The 4 pieces are various sizes.